Africa has always been a great destination for tourists. In fact, tourists who visit this continent are usually spoilt for choice. Or how can you describe a situation whereby you’re expected to select only one destination with over 40 options placed before you with mouth-watering offers from these African resort spas? Will you settle for culture, wildlife, heritage, adventure or a fair share of nature? Perhaps the mountains, coasts, deserts … (you name them) will suffice. But regardless of which country you choose, just know that a trip to Africa has never disappointed anyone; you can’t be the first. Now, to those planning for a vacation in Africa, we will be making a quick review of the top 10 African resort spas for you to choose one. Twelve apostles hotel gives a perfect blend of a sophisticated city hotel coupled with a resort, beach, mountain trails, a heated infinity pool, as well as a remarkable ocean view. Besides, this resort is strategically located, which makes it easy for anyone to access the city of Cape Town. But most importantly, the resort is popularly known for its sanctuary spa that uses Elemis products with moya crystal therapy to give its visitors a treatment of a lifetime. This resort is located 4 km off Victoria Falls in Zimbabwe. It’s notably preferred because of its strategic perching on a bluff—in the upstream of Victoria Falls. It actually takes approximately five minutes to drive from this resort to Victoria Falls; thus, recommended for anyone who wants to visit the fall. In addition to that, this hotel comes with a wide range of fun activities and entertainment, like the 18 hole golf course and spa services. 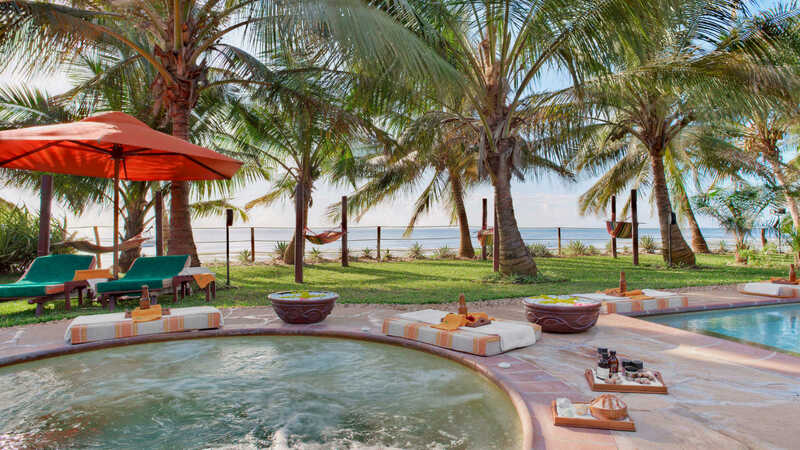 Ocean Beach Resort and Spa is definitely among the best hotels in Kenya; not to mention the best in Malindi. From great rooms, the best restaurants and bars, to swimming pools, beauty parlour and spa; ocean beach is certainly the hotel to look for when you land in Kenya and find yourself anywhere near Mombasa. Doubletree resort has 3 restaurants, an outdoor pool, a fitness facility, and a health club. Besides, it also offers a wide range of recreational amenities, such as fishing and snorkelling. For spa, the resort offers one of the best African Resort Spas for body and facial treatments. Constance Ephelia is a 5-star hotel with 4 outdoor pools, a private beach and a full services spa. Apart from that, the resort offers a number of recreational amenities, like sailing, scuba diving, snorkelling, hiking, biking, kayaking and eco-tours. In Seychelles, it is ranked as the best resort. And if you rank it in Africa, it deservedly fits in the top 10 list African Resort Spas. This luxurious hotel is located near Wilderness National park (Garden Route), close to Victoria Bay beach. It actually has one outdoor pool and one indoor pool, also. On top of that, it features an array of recreational amenities: scuba diving, mountain biking, sailing, boating, golfing, surfing and kayaking among others. Sofitel Cairo El-Gezira is located on River Nile, right in the hearts of Cairo. It features a stunning infinity pool, great rooms, a number of restaurants and a full-service spa, as well. Similarly, this resort has sun lounges, 2 spa tubs, and a fitness centre. Intercontinental Lagos Resort, located in the hearts of Lagos on Victoria Island, offers a perfect view of Lagos skyline, grandiose accommodation, and an ample meeting space for affluent business people. Additionally, the resort has a number of premium amenities, like the state-of-the-art fitness centre, an infinity pool, spa and executive lounges. This stunning hotel can be found along Malindi road, near Bamburi. It’s, in fact, one of the most popular hotels in Kenya, which attracts the largest number of tourists who visit the country. The hotel can be recommended to anyone looking for a refreshing beach experience, honeymoon destination, wedding, or a spa holiday. Furthermore, the resort features a full-service spa and an infinity pool. Sea Cliff resort is an exemplary sanctuary of peace, tranquillity, and beauty. It boasts of 120 rooms, tropical scented gardens, sparkling pools and Zanzibar cuisines. The resort can be found on the Northern-Western coast of Zanzibar, near stone town. The best part is that the hotel is located on top of a cliff, which makes it easy for its visitors to enjoy the panoramic view of the Indian Ocean from balconies of the resort. For recreational purposes, the resort offers a fully equipped gym facility, 2 tennis courts, water sports, and a squash court.